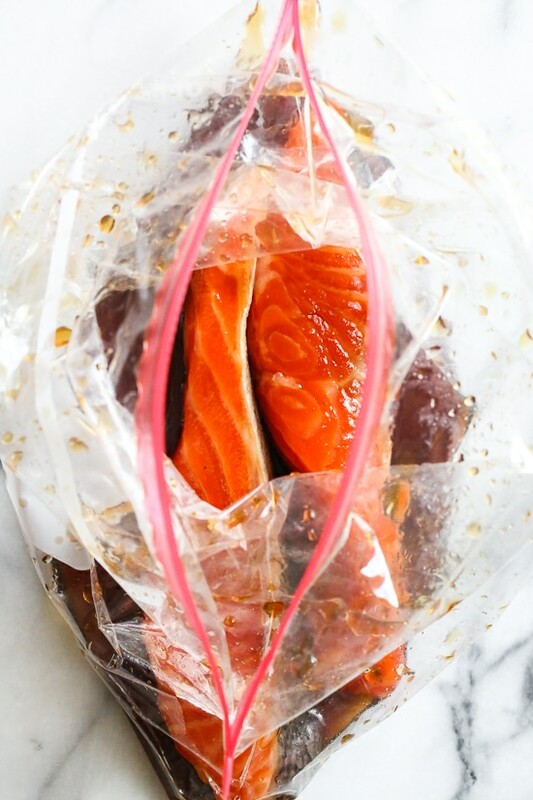 Combine the soy sauce, mirin, and honey in a resealable bag. Meanwhile, place the marinade in a small pot, bring to a boil and simmer on low until thickened and reduced by half, about 8 to 10 minutes. Spray a large skillet with oil. Cook the cauliflower rice in a skillet over medium-high heat until tender, 4 to 6 minutes. I am assuming I can also substitute Teriyaki sauce for the soy/mirin/honey sauce mixture? This has literally become a staple in our home. Thank you Gina! I LOVE this recipe! It’s got me eating healthy salmon again! I just put the remaining sauce in the microwave to heat it up instead of pulling out another pot. It’s super fast & tasty serving with some frozen Asian vegetables. 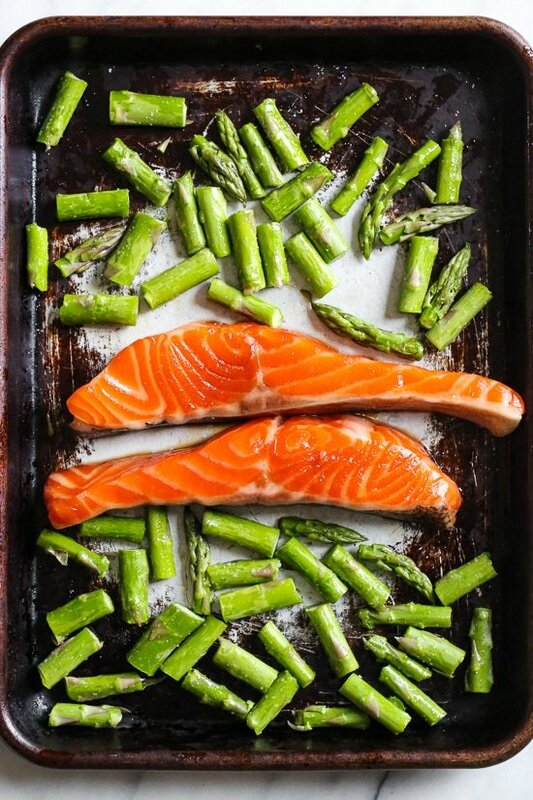 I just throw them on the pan with the salmon. Super quick and delicious!! Delicious! Only 4 smart points! I willl be adding this to my “go to” recipes. 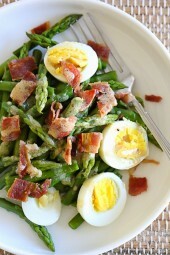 Could I do green beans instead of Asparagus? For me this marinade fell flat, too sweet and not enough depth. Maybe it’s worth trying again to see if I failed the first run. This was amazing!!! Thank you for all the amazing recipes. When I enter this into weight watchers app recipe builder it comes up with a lot more points. Why is this? I used the exact ingredients you have and serving size. Is it because you won’t actually use all the marinade (which makes up most of the points)? Gina! What brand miring did you use? Maybe it was my doing, but this recipe didn’t work for me. It was fine, but not great. Delicious, fast, and easy – another winner! Delicious! Love the flavor of the marinade/glaze. Wasn’t able to find Mirin, substituted white wine/sugar. First time trying cauliflower rice…loved it! Great recipe – family loved it! Four thumbs up from my family and super easy to make. Thanks Gina! This was fantastic! Quick, easy, healthy and delicious. This was delicious and the homemade teriyaki sauce was the best! I wasn’t sure about it until it was reduced and wow,! Better than any store bought one. This was so good & easy! The whole family loved it!! Love this! 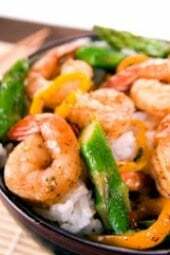 I added a dash of sesame seed oil to give it just a little extra – it was great! Thanks for the recipe! 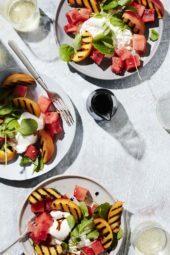 How are you coming up with the points for Weight Watchers? When I put the nutritional information into my app the points are a lot higher, but I’m not sure why. Could you please clarify what are the ingredients of the marinade? Maybe I am overlooking it but I cannot find it. Thank you. I love your recipes. Between your recipes and counting points on weight watchers I have lost 16 lbs since December. First three ingredients 🙂 … congrats!! Made this and it was excellent! Very easy to follow directions and the whole family liked it! Made this receipe as soon as I saw the email . This is a very good recipe!! !It was easy to make. I could not find the Japanese Mirin in my small town. Substituted Vignoles white semi sweet wine. Love Love Love this! Thank you! What if I don’t have mirin? Anything I can substitute? I didn’t have mirin and couldn’t find any at 2 grocery stores. I just used Sherry Cooking Wine and sugar. You can look up measurements, but I always like to guesstimate when cooking. My brother goes to Alaska every year for salmon fishing, where the fish is processed, sealed & flash-frozen before he returns to Phoenix. I’m the lucky recipient of the majority, since he knows I’ll make him a nice meal. Your salmon recipes are right up our alleys! Can’t wait to try this one! 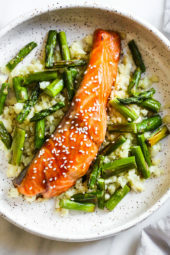 Unfortunately my husband does not like salmon, can I use cod, or other fish for this? Black cod would be lovely! Thank you, Gina! 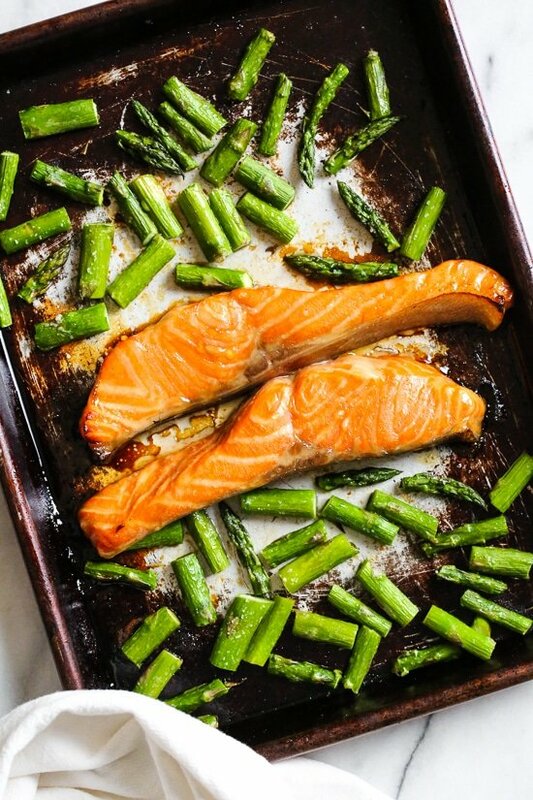 I’ve been trying to work more wild salmon into my diet, and this looks delish AND easy! 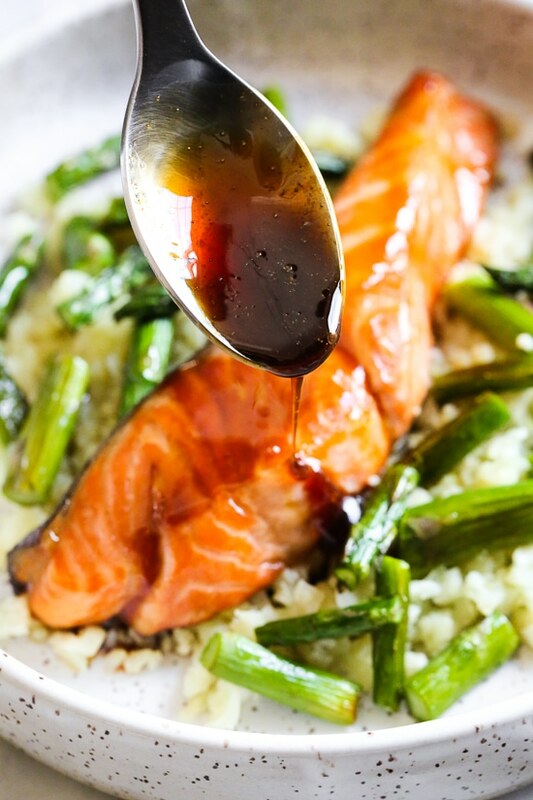 I’m eager to try your Gochujang glazed salmon also! Keep ’em coming, girl! This looks like my kind of meal! I love all things salmon. One question, though, how much sake? I don’t see it listed in the recipe, only in the directions. In the first direction you mention sake but its not on the ingredient list?